The British Army offers a bursary to nursing students. If you are looking for an exciting, varied and challenging career, becoming an army nurse could be for you. The Army Medical Services (AMS) has a worldwide reputation as a leader in healthcare and medical research. Army nurses deliver exemplary care to the army at home and on operations and have the chance to experience some challenging environments as they hone their communication, leadership and clinical acumen. Nursing skills are delivered in a variety of clinical settings, including the NHS, medical regiments and field hospitals in the UK and overseas. One inspirational army nurse, Major Ruth Truscott, was honoured with the award of Associate of the Royal Red Cross (ARRC) in recognition of her outstanding work in Afghanistan. She led a multi-national theatre team that achieved a 98% survival rate for patients, despite serious injuries. Being part of the AMS provides an opportunity to gain clinical qualifications and military skills as well as experiencing adventurous training and sport. Another member of the services, Lieutenant Hibbard, was funded by the army to train in cross-country skiing, and took the opportunity to travel the world and compete. Nursing student Kat has competed in judo around the world while the army supported her through her nursing degree. Nursing student – Those yet to apply to university must first complete 14 weeks initial training, where the fundamentals of being a solider are taught. They are then sent to Birmingham City University to complete a three-year nursing degree while being paid a wage as a full-time soldier of over £14,500. 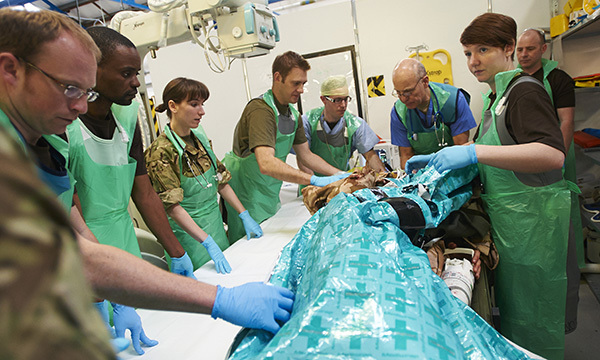 Studies involve clinical placements in both military and NHS settings. Applicants need 120 UCAS points plus 5 GCSE passes at grade C/4 that must include English, maths and a science. Nursing bursary – Applicants for an army nursing bursary need to have secured a nursing place at a UK university or started a nursing degree. They receive taxable payments annually of £5,000 for up to three years, and after completing their degree and initial army training they receive a lump sum of £27,000. They develop leadership skills throughout their career and can apply to become a commissioned nursing officer. After completing a nursing degree and initial military training, AMS members undertake preceptorship training and develop their skills under the guidance of an experienced army nurse. There are opportunities to advance their expertise and start a specialist training pathway, and they can gain recognised qualifications such as supporting learning and assessment in practice. The army also funds nurses to study at Master’s level and beyond. 38 days annual leave entitlement. Free medical and dental care. Free access to sports and gym facilities.